Author. Whisky. Hair. Headshot – The Author’s Archive | AUTHOR. ACTOR. SWORDSMAN. ← If Only That Hair Was Mine! Author discovers old photo of Jack Absolute! Ever since I pulled out that shot of me duelling as Jack Absolute to accompany my last blog, I’ve been both intrigued and appalled by a pile of unsorted photos. And I thought: well, why not put them out there? After all, they are the way stations along the storyteller’s road leading via acting to my becoming an author. Each image has its own story, the when, where and why of the shot. Each shows the version of me I was exploring at the time. And as a bonus, all show me with HAIR. Yupp, I had it. And here hare here (for you Withnail fans) it is: the first in a rambling series. Cool? I certainly thought so! Just graduated school and euro-railing around Europe. My best friend and travelling buddy, John Sharpe, took the photo. We’d gone to a liberal North London public (private in North America) school, UCS. Out of a graduating year of about 100, 96 became lawyers, doctors, accountants, bankers, professors, and 2 became heroin addicts. John became a photographer and I became an actor. This actually was my first ever ‘headshot’. My father gave it to a casting director he knew and I went up for the odd job. Oh my God. The hair. The loons. The lighter. (I was trying to look even cooler by smoking unfiltered Gitanes and failing because I coughed so much). The White Horse was dispatched in alternating shots on Biarritz beachfront. I’d never been drunker. For a while it was great, though the woman in the donut stand didn’t think so. ‘Allez vous en!’ she shouted. I, in my then impeccable French, prodded her wares and declared, ‘Je suis l’inpecteur de beignets!’ It ended badly with me locking myself in the local train’s toilet and refusing to open the door. John had to pull the emergency stop cord and get the guard to open up. He took revenge by making me sleep with my head outside the tent you see, the zipper pulled down to my neck so I didn’t wander off again. What did my look mean? Hard to read. I was definitely striving for cool. But I can be forgiven. 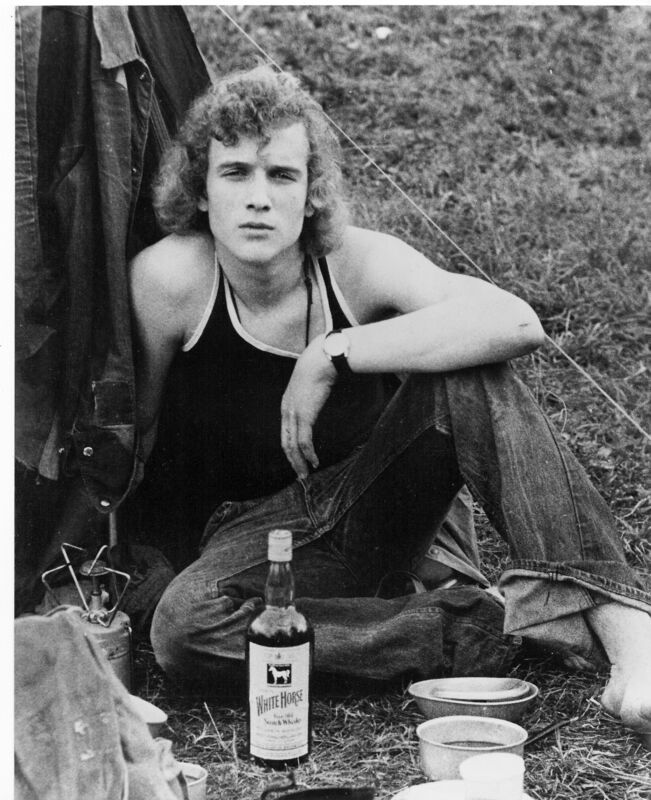 I mean, 18, my parents just about to move away to Spain; me, going to work for a year in London (Motorcycle messenger) before attempting drama school and the official beginning of my life as a storyteller. The world was before me – just had to make it through the whiskey to get at it! This entry was posted in Uncategorized and tagged acting, author, creativity, Inspiration, novels, traveling, Writing. Bookmark the permalink.